As the temperature is rising we parents have to pay attention to our children’s fluid intake too. But it is important. We, adults, are prone to assume that they would tell us if they were thirsty. But just think about yourself – you cannot recognise or respond to the feeling of thirst very often (because we mistake it with hunger or we are just too busy to drink etc.). Why Drinking Water Will Make You Happy? So it is an irrealistic expectation towards small children to be responsible for their own water intake. They very often cannot even recognise that they are thirsty. All that they feel that something is not right – and what we see is tantrums, dissatisfaction, whimpering and moaning. Basically, the voice of a frustrated child. Well, they suffer when they don’t drink enough. 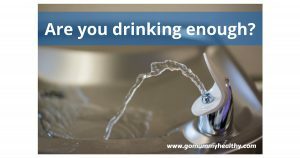 I know it is a very popular topic: How to get your children to drink enough fluid? But I think the real question is rather: How to help your children to recognise their thirst sensation? And how to provide an easy (!) access to a drink all the time. I attempt to answer these questions in this post. So we have to watch them and recognise their thirst. Children are not different from us in terms of how fluid intake influences their mood and their behaviour. Only they cannot recognise and express their thirst. 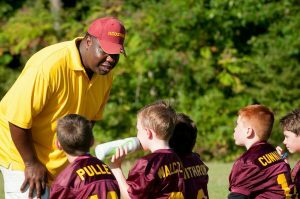 We parents however very often cannot read well the signs of thirst on our children. What we see, that they cannot focus, they make tantrums, they are moaning or they behave like little devils. When my daughters get home from the nursery the first thing what I do is offering them water. I know they are not just thirsty but tired too, giving them a drink calms them down. This is because they are usually too busy in the nursery to have a drink (that it is always available for them in the nursery, of course). By the time they get home they are irritated and moany – they probably have a headache and/or discomfort from being dehydrated. 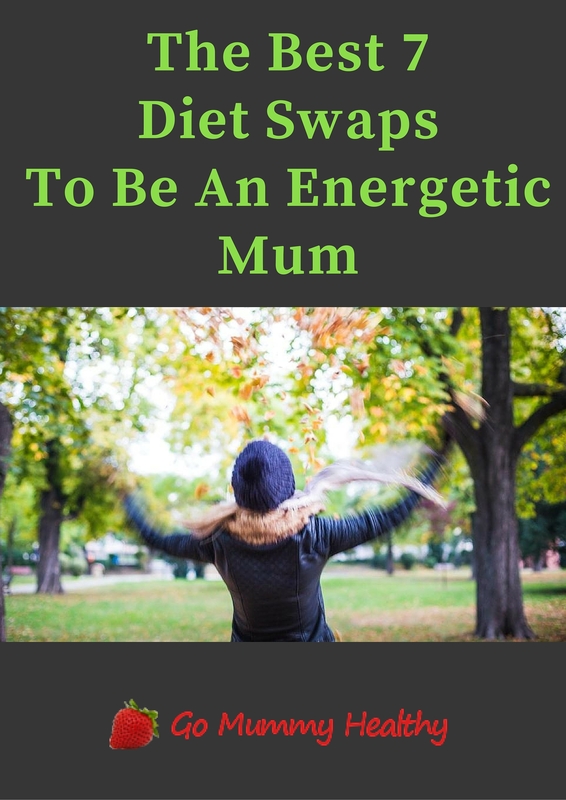 By submitting the form below, you accept that you subscribe to the Go Mummy Healthy newsletter. You can unsubscribe anytime. Do not look for sweating as children sweat less. Also, because they have a smaller body than adults they get hotter during exercise. Children’s fluid intake: how much is enough? An average child needs about 6-8 glasses a day – that’s about 1500-2000ml per day. Obviously, it depends on their activity level, the climate where they live and their body weight too. But how we do know that our children’s fluid intake is right? Of course, we don’t need to measure this amount of fluid out for them. The point would be to help them to recognise their thirst and make sure that they have an easy access to a drink. What to give your child to drink? No question that water is the best for them – just simple tap water. 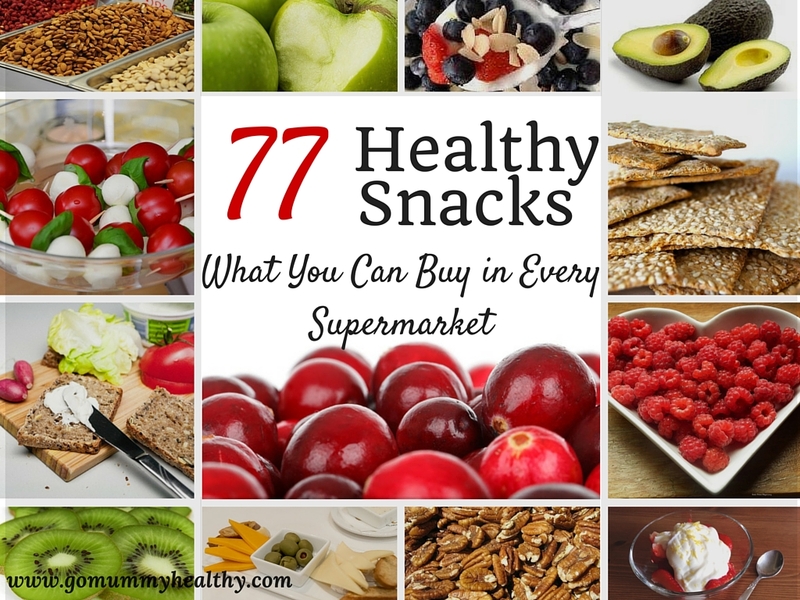 I know that every parent would like to give the best for their child(ren) doesn’t matter how much it costs, and we are ready to buy anything that is addressed for children and claimed or looks to be healthy. But in this case – believe me- the simple tap water is the best solution. is the best drink to hydrate the human body quickly. All soft drinks, fizzy drinks, fruit juices, smoothies absorbed by the body more slowly and so they can make dehydration even worse. doesn’t contain hidden calories – like added or naturally occurring sugar, so it doesn’t contribute to obesity. doesn’t raise the blood sugar level and doesn’t affect their behaviour or sleep. is always and widely available. Well, This last one is not entirely true when you are out or you spend your holiday in a foreign country. Unfortunately – but not accidentally I think, – there is just a very few drinking fountain on the streets and public places. (Obviously, this can be different by country.) Also in some countries, it is safer to drink bottled water than tap water – but we really do not need to worry about these in Europe. So there are cases when we have no other choice than buying a drink. Bottled water, mineral or spring water is usually sold along soft drinks and energy drinks and this is very tempting. Also, they look better value (just compare the simple package of water to the attractive coloured package of soft drinks). Still, the water is the better, healthier and more satisfying choice for children. Occasionally: Coconut Water: Coconut water contains natural properties like vitamins, minerals, sugars, vitamin C, and electrolytes. Lemonade is another great option for younger kids, just keep an eye on the sugar content. In moderation: Fruit juices are very popular among children, and they can contain vitamins and minerals, but because of their sugar content, I would not recommend them as a fluid replacer. The best to drink them occasionally and dilute them 50:50 with water (as diluted fruit juices can absorb quicker). 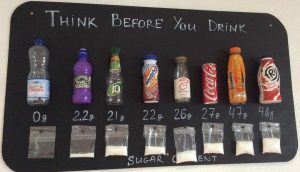 Never: Fizzy drinks, soft drinks, caffeinated drinks (like tea, coffee, coke) and alcohol. these are not suitable for children. The main goal is not just to make them drink more, but to recognise their thirst without your help. And they love to be independent. A drinking station is a good idea: just place a water dispenser on their own level and place some cups next to it. First, they surely will play with it but later they feel more natural and they will use it properly. Instead of nagging or promising them stickers as a reward, make an easy to access their water all the time. Small children just cannot reach the tap or counter to fill some water to themselves. When they need to ask for a drink they are prone to drink less. The best if their drink is always visible and available for them. Even a plain glass of water can be very exciting if there is something interesting in it. You can add to their drink: fresh or frozen fruit, rose petals, lemon slices, orange slices, mint leaves, lemon balm leaves, cucumber slices etc. They love to have their own special equipment. It can be a shop-bought cup with their favourite cartoon character or a simple plastic bottle decorated by their own hands. the point is that this belongs to them, they like it and they are happy to use it. Kids just love ice. They can play hours with ice. It can be a few ice cubes in their drink or home-made water based popsicles (just freeze some diluted fruit juice in an ice tray and stick candy stick in each slot). You can add some fruits too like strawberry slices, grapes or melons. It is also fun to freeze interesting shapes like hearts, diamonds – or freeze small plastic toys inside (make sure they don’t break or hurt anyway). You can add a few drops of food colouring too just to make it even more attractive. The good example works here too. It is wasted to time to preach about the importance of drinking water if you do not exercise it yourself. Drink with them, raise your glass with them at every good occasion – but remember it must be water. Then you do not need to say anything. Use unusual “cups”: fill water into carved fruit like in a half orange skin (coconut shell, carved melon half) and offer it with a colourful straw and some decoration like orange slices or paper umbrella. I know it sounds so straight forward, but frankly we very often just forget it (even I am guilty of this). Laying the table with plates, cutlery, glasses and water is not just for special occasions – it really should be the everyday routine. If your children really do not want to drink then often offer them high water-content food like fruits (like watermelon, strawberries), vegetables (like cucumber, celery), broth, soups, frozen popsicles with fruit puree or jelly. 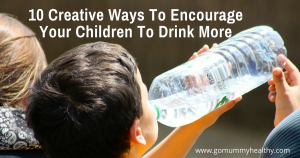 Do you struggle to get your kids to drink enough water? Feel free to leave a comment below.